The newest NBA Power Rankings are out from ESPN's Marc Stein (@ESPNSteinLine on Twitter.) The widely perceived to be yearlong doormat Cleveland Cavaliers are definitely gaining a little bit of respect in the NBA. I use both "little bit" and "respect" literally, since they are still flying under the radar, but seems like begrudgingly moving their way into the ranks of legitimate NBA teams in the eyes of the national media. 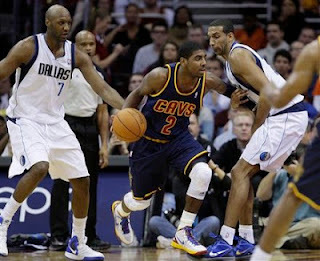 Of course, the young Cavaliers are led by the shockingly awesome Kyrie Irving. I gotta admit I was torn on whether drafting a point guard with only a dozen more college games than I have played in would be the best cornerstone for the franchise going forward. That being said, doubts have been erased--with epic flourish--after less than six weeks of the season. Doesn't Irving have more game winners for the Cavs than That Guy in Miami already? Seems like it, that's for sure. And what else can be said about Anderson Varajao, who is having a dream stretch of games right now. The Cavs rank above 13 teams. And since they hadn't beaten a team above .500 before this weekend, that seems about right. Teams like Detroit, Phoenix, Charlotte, New York and New Jersey rank below them. Teams that Cleveland is pretty solidly better than. Teams like Chicago, Philadelphia, San Antonio, Los Angeles (x2) and South Beach rank above them. Teams that more often that not will come out on top of the wine-and-gold. The Cavs do have victories over a few of those higher teams, notably Dallas this past weekend, but growing pains show up once in a while when going against the best of the best. Hell, we'll take it. There's a bit less than three months remaining in this shortened season. And the season can go a few different ways. The goal for all Cavs fans is to finally host a parade down Euclid Avenue. But opinions are definitely split on whether squeaking into the eighth (or seventh) seed this year is a desireable outcome. Or whether a 20 game losing streak, which would be very sour medicine going down this year, would pay off with long term franchise health going forward. Regardless, it's out of our control. My opinion is that the Cavaliers, being so young and new together, will mesh even better as the year goes on, and will have fresher legs with this compressed schedule than many older and more veteran teams. The opposite can be true though--if the Bostons and Dallases of the world start getting their legs underneath them as they play themselves back into shape, the road might be quite rocky for the juvenile Cavaliers. Any way it goes, it's going to be a fun ride over the next few weeks and next few seasons.